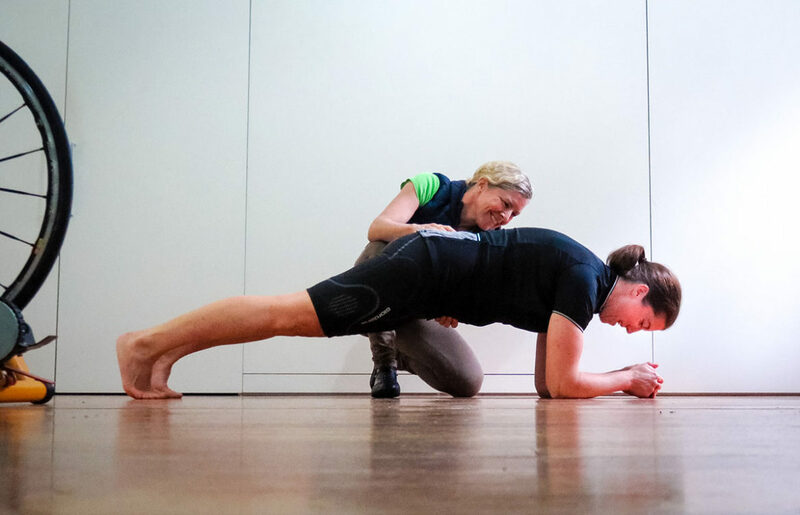 Planking, as shown in this exercise, is a great crude way to improve strength of the core muscles. Some cyclists, who have an otherwise healthy spine, can get back pain especially in relation to a period of hill training, or a big event with loads of vertical. Failure of their core muscles to counteract the power the legs are putting out is a common cause. The benefit for cyclists is that the position simulates that position we use when riding, as opposed to other core exercises that involve laying on the back. This position also uses the erector spinae muscles, which for cyclists are probably more important than the abdominal group in holding steady on the bike. This stretch illustrated here is a great stretch for road cyclists to do prior to getting on the bike. It stretches out the ‘things at the back of the leg’ like the hammies, calves and their surrounding fascial connections and nerve coverings, that all get tight and prevent us getting into a good ergonomic position on the bike.